The bile duct is one that connects the liver to the small intestine. This tube-like structure is composed of two parts; the upper portion comprising of the liver and the bottom part consisting the pancreas. This disease is mostly apparent around the liver and in the bile duct surface. 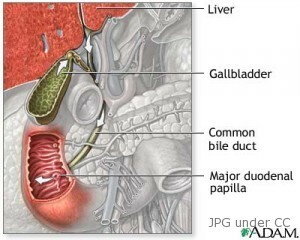 There are cases where the growth in the bile duct would spread normally in the gallbladder region. After such time, the other regions in the stomach or abdomen area are also involved. Bile duct cancer affects almost thousands of people in the United States alone. This disease normally targets those who are in the age of 65 years old and above and are commoner among men. The bile is considered to have one of the most important roles in the digestion process. This mainly digests fats consumed by the body and discharges the bile into the small intestine connecting to the gallbladder. So after a fatty meal, the bile has to do its thing. This types of cancer are formed into three groups each one having its own distinctions and characteristics. Intrahepatic – This is a type of bile cancer found in the inner portion of the liver. This is not considered the most common of all since figure shows that 1 out of 10 people suffer from this type of bile duct disease. Hilar (perihilar) – This is also known as Klatskin tumor and is deemed as the most typical of all biliary cancer. Distal – This kind of cancer in the bile is normally found in the lower portion of the bile duct leading to the small intestine. This generally manifests itself in the bottom part where the pancreas is located. This disease has no unique and one of a kind symptoms. It is rather atypical that most sufferers of this disease are those reaching their old age. As indications normally come about slowly, here are the following signs one should be circumspect. While causes of this disease are still unknown, a recent study showed that people should be predominantly on guard of the risk factors that come along with this kind of disease. These risk factors increase the chances of a patient to acquire the disease in the latter part of one’s life. Inflammation – According to scientists, this factor is one of those being focused on. Soreness and irritation often lead to adverse changes in a person’s DNA. When this happens, DNA cells develop and grow irregularly that leads to the formation of cancer cells. Based on some recorded cases, people who inherited DNA mutations have more times likely to have cancer in the bile duct. Ulcerative colitis – This is another risk factor that comes from the inflammation and swelling of the large intestine which could unfavorably lead to cancer. Cirrhosis – This is one disease that could lead to biliary cancer. This disorder is primarily due to an impaired liver caused by too much consumption of alcohol. In some cases, if a patient has a history of hepatitis, the risk of having this cancer is increased. Bile duct stones – These stones are smaller than gallbladder stones, but regardless of the size, this one still counts as a possible cause of cancer. Abnormalities of the bile ducts – The moment the bile is prevented from being emptied and doesn’t make way for reflux, higher risk of bile duct cancer or cancer of the liver is possible. Treatments for biliary cancer patients vary on different factors, such as the stage of the cancer, the health condition of the patient, the age and more importantly, their personal preferences. These are some of the medical procedures suitable for the treatment of this type of cancer. Surgery – This medical approach is the first line of treatment for those suffering from biliary cancer. Oftentimes, removing small tumors or part of the bile duct is necessary to eradicate dangerous cancer cells. On other cases, if the cancer is grave, the removal of the lymph nodes and the surrounding tissues are suggested. Liver Transplantation – This kind of procedure is done specifically if the growth in the bile duct has not spread in the exterior lining of the liver. The survival rates of this kind of procedure are similar with those that do not undergo transplantation. There are some cases where growth in the bile duct has a high recurrence rate, yet most patients that have undergone this kind of medical procedure have been cured in the process. Biliary Drainage – The placement of stents (a tube use for draining) is the one used in this medical treatment. This kind of therapy is more focused on providing relief of warning signs of cancer and in improving the quality of life patient leads. Nevertheless, there are still some limitations in opting for this palliative therapy. The moment the growth develops from where the vessels enter, stents may not be the best possible treatment to go for. Photodynamic Therapy – This is a kind of treatment where a chemical is induced directly into the bile duct and the tumor through a light-sensitive substance. This kind of procedure infuses chemical reaction thereby killing growth and cancer cells in the process of the therapy. This is best provided to jaundiced sufferers who are not entitled for surgeries and other advance treatments. Chemotherapy – This kind of treatment for biliary cancer patients are oftentimes short lived. This procedure is mainly prescribed for the purpose of slowing down the progression of the cancer. Therefore, the survival of a patient will greatly relies on the response of the body as well as the reaction of the tumor to the treatment.